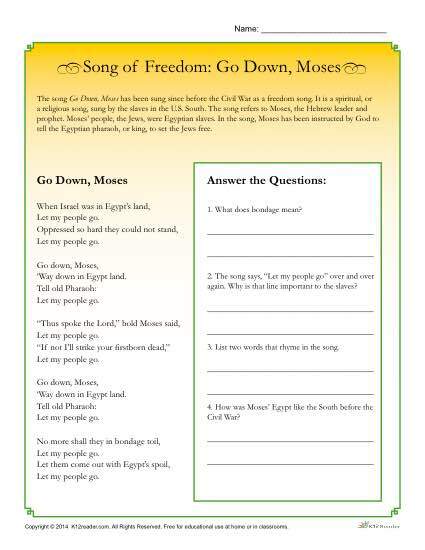 The song Go Down, Moses has been sung since before the Civil War as a freedom song. It is a spiritual, or a religious song, sung by the slaves in the U.S. South. The song refers to Moses, the Hebrew leader and prophet. Moses’ people, the Jews, were Egyptian slaves. In the song, Moses has been instructed by God to tell the Egyptian pharaoh, or king, to set the Jews free. In this activity, students read lyrics to the song and answer related questions.